The Bullskin Township Historical Society was established in 1996. Our sole purpose and mission is to restore and preserve the history and heritage of Bullskin Township for our future generations. One of our current projects is the restoration of the historic MOUNT VERNON IRON FURNACE. 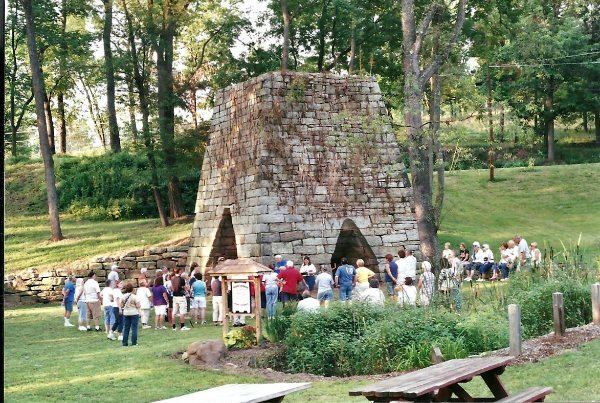 Our furnace was built in 1801 by Ironmaster Isaac Meason and is located near Mounts Creek in Wooddale, PA. In 1991 it was listed on the National Register of Historic Places. New Members to our society are always welcome! We meet the 3rd Thursday of the month (February - November) at the old Stone Cabin located at the Furnace Grounds. Throughout the year we are involved in a number of different activities which include: Monthly Meetings, Guest Speakers, Fundraisers, Historical Day Trips, Summer Picnic, Heritage Days Festival, Christmas Open House / Antiques Appraisal, and our Christmas Banquet. Our STONE CABIN is open the first Saturday of the month (March - November) from 10:00 am to 2:00 pm. Come for a visit and look at our collection of local artifacts, old photos, books, and maps OR come and do family research. We also have a gift shop located inside our Cabin. Our furnace grounds are open all year and we have picnic tables for your convenience. Need help with your Family Research? E-mail us at: bullskin1784@aol.com and we can try and help you or point you in the right direction!